Littleton Farmers Insurance Agent, Jeff Pasquale, is a man of many talents! He has a unique way of connecting to people through the many books he has authored, his leadership and personal coaching, and business background. 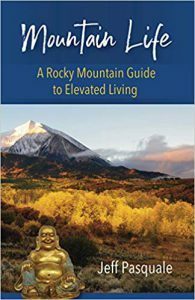 His New book: ‘Mountain Life –A Rocky Mountain Guide to Elevated Living’ was just released and is available at the Tattered Cover at Littleton’s Aspen Grove and Colfax locations. “Mountain life highlights what’s good about life, no matter where you live. Mountain life is about enjoying life, living with fewer hassles, and not taking yourself too seriously”. Jeff uses his 20 years of business coaching, insights and passion, and 10 years of insurance experience to help people; with a primary goal of educating his clients on the importance of insurance and help them make the right decisions regarding their coverage – whether that’s auto, home, life, business insurance, and more.